I've been doing some research about good and bad brands of food for bettas, so I thought I would post what I have found, and information about whether all of the popular brands of food are really good for bettas or not. Fish Meal - "Fish meal is the clean, dried, ground tissue of undecomposed whole fish or fish cuttings, either or both, with or without the extraction of part of the oil." Basically meal is ground up, dried out parts of the animal that are not considered human grade. They are higher in salt but lower in protein and nutrients then whole meats would be. Foods that contain just "fish meal" are not good, foods that contain more specific items like "Antarctic Krill Meal" or "Herring Meal" while still not as good as whole fish, are a much better option then those that contain just "fish meal"
Foods that contain whole meats and not too many fillers are going to be much better for your bettas then foods that contain meal and lots of fillers. 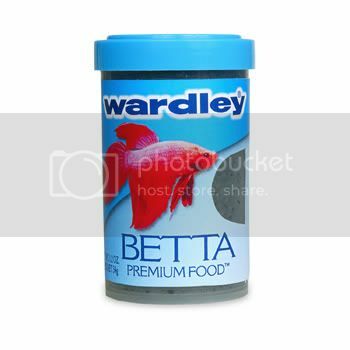 Now I'll post some popular brands of betta food, and their ingredients. And put the title in Red if the food is low quality or bad, Purple for neutral and Green if the food is a good choice to feed to your fishie! 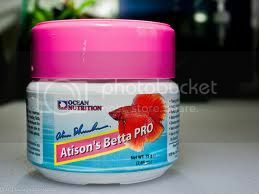 Ocean Nutrition’s Atison Betta Pro is highly regarded among Betta splendens keepers. In the aquatic food business of today, aquarists are spoiled for choice. Out of the multitude of generic feeds, many have been specially tailored for specific fauna, and the Betta Pro is one of them. Pure brine shrimp embryos | wheat flour | vitamins (stabilized ascorbic acid, vitamin E supplement, niacin | thiamine mononitrate | folic acid | calcium pantothenate | riboflavin | menadione sodium bisulfate complex | Vitamin A acetate | pyridoxine HCL | Vitamin B12 supplement | Vitamin D3 supplement, biotin) and preservatives (calcium propionate, ethoxyquin). New Life Spectrum Thera-A Regular Formula is a hormone-free, color enhancing formula. The non-medicated anti-parasitic formula helps fend off parasites. An excellent diet for newly acquired fish and brood stock. Formulated for all types of omnivore, herbivore and carnivore tropical fish. Spectrum food is made with high-quality easily digestible krill and herring protein with all-natural color-enhancing ingredients for a balanced diet that boosts immune system function and enhances the full spectrum of your fish's color. With the belief that all fish require a complete and fully balanced varied diet, New Life also contains algae meal, that consists of seaweed, kelp, and haematococcus pluvialis (a micro algae), a premium grade of natural spirulina, as well as a fruit and vegetable extract that consists of spinach, red and green cabbage, peas, broccoli, red pepper, zucchini, tomato, kiwi, apricot, pear, mango, apple, papaya, and peach. Our premium line of fish food is made in the USA, in an FDA approved state-of-the-art facility. All of the ingredients used in New Life Spectrum premium fish foods are thoroughly analyzed and certified, ensuring only the highest grade of quality and purity in each and every container of our food. Whole Antarctic krill meal, whole herring meal, whole wheat flour, algae meal, garlic, soybean isolate, beta carotene, spirulina, vegetable and fruit extract (spinach, red and green cabbage, pea, broccoli, zucchini, tomato, red bell pepper, kiwi, apricot, pear, mango, apple, papaya, peach), vitamin a acetate, DL alphatocophero (E), d-activated animal sterol (D3), vitamin B12 supplement, thiamine, riboflavin supplement, pyridoxine hydro-chloride, calcium pantothenate, L-ascorby-2-polyphosphate (stable C), choline chloride, copper proteinate, ethylenediamine dihydroiodide, cobalt sulfate, ferrous sulfate, manganese sulfate. The fresh seafood ingredients in Omega One are particularly attractive to Bettas, since they thrive on higher protein foods. 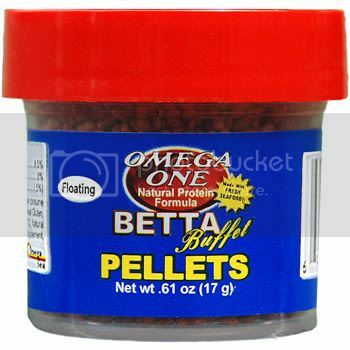 The cold water marine proteins and fresh omega fats in Betta Buffet micro pellets make it a nutritional must for all Bettas. With natural pigments in salmon skins for vibrant colors. Additionally, the protein binder in Omega One, which is not water soluble, results in a much cleaner environment, especially in a small tank. Never clouds water! 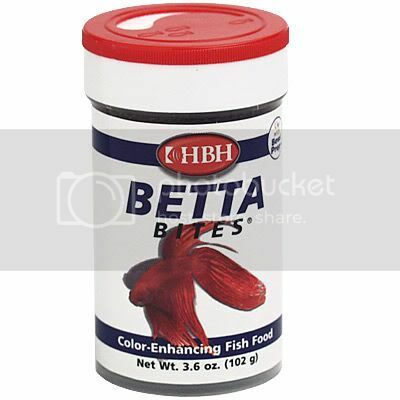 A highly nutritional formula that contains freeze-dried blood worms for maximum palatability and natural sources of pigments to enhance brilliant betta fish colors. Krill, fish meal, fish protein concentrate, wheat flour, corn meal, squid meal, oatmeal, wheat gluten meal, dried seaweed meal, soybean flour, oatmeal, wheat gluten meal, dried seaweed meal, soybean flour, soy protein concentrate, fish liver meal, dried yeast, salmon oil (ethoxyquin used as preservative), cochineal extract, squid liver meal, shrimp meal, vitamins (cholecalciferol, biotin, d-calcium pantothenate, folic acid, inositol, niacin supplement, riboflavin-5-phosphate, calcium inositol, L-ascorbyl-2-monophosphate, vitamin A acetate, thiamine hydrochloride, vitamin B12 supplement, pyridoxine hydrochloride, vitamin E supplement, menadione sodium bisulfite complex (source of vitamin K activity), yeast extract, fructooligosaccharide, lecithin. 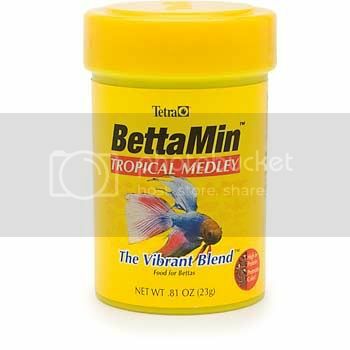 A unique floating betta formula with added natural color-boosting ingredients to help brighten the color and enhance the beauty of your betta fish. 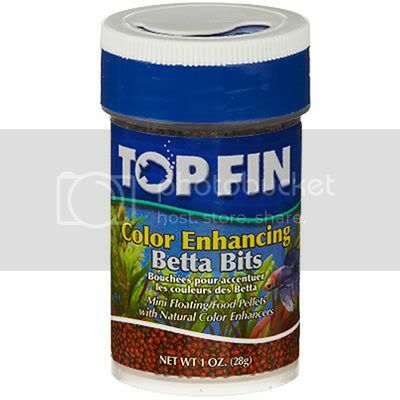 Betta Color Enhancing Bits are fortified with vitamins and minerals for complete nutrition. This unique floating pellet simulates natural feeding behavior and contains natural color enhancers, including red algae and spirulina. 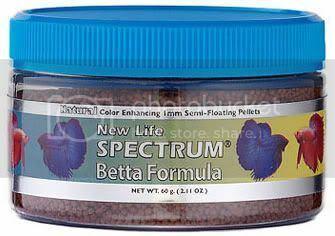 Feed as a supplement to standard Betta Bits or feed exclusively for maximum color enhancement. Fish meal, shrimp meal, soybean meal, wheat flour, corn gluten meal, fish oil, squid meal, yeast, calcium propionate, rice bran, proteinase enzyme, garlic, brine shrimp, astaxanthin, spirulina, red algae, l-ascorbyl-2-polyphosphate, vitamin a acetate, choline chloride, a -tocopheryl acetate, niacin, d-calcium pantothenate, riboflavin, thimain mononitrate, biotin, pyridoxine HCl, folic acid, d-activated animal sterol, vitamin B12 supplement, vitamin K3 supplement, inositol, calcium iodate, dicalcium phsophate, copper sulfate, sodium selenite, cobalt chloride, zinc sulfate, ferrous sulfate, magnesium sulfate, manganese sulfate. Nutrient-packed, color-enhancing fish food for Bettas. The micro-pellet diet improves Betta health, growth, and coloration. Fish meal, wheat flour, soy flour, fish oil, brewers dried yeast, squid meal, soy lecithin, krill meal, l-ascorbic acid phosphate (source of vitamin C), choline chloride, vitamin E supplement, niacin supplement, astaxanthin, d-calcium pantothenate, riboflavin supplement, thiamine mononitrate, biotin, pyridoxine hydrochloride, folic acid, vitamin A supplement, vitamin D3 supplement, vitamin B12 supplement, manganese sulfate, zinc sulfate, ferrous sulfate, copper sulfate, sodium selenite, potassium iodate, ethoxyquin (preservative), propionic acid (preservative), red 40. 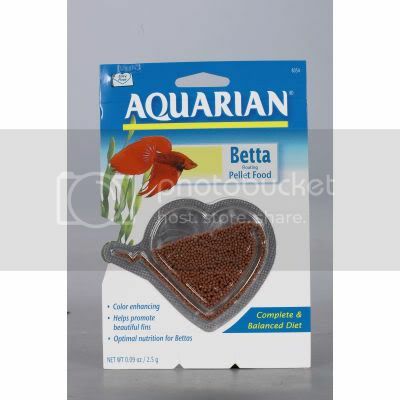 This floating pellet food is a complete and balanced diet, specially formulated to meet the nutritional needs of Bettas. Fortified with vitamins, minerals and spirulina, it brings out the Betta's natural, vibrant colors and the protein rich formula helps promote the growth of long, beautiful fins. Wheat, soybean meal, fish meal, ground corn, soy protein isolate, shrimp meal, canola oil, dehydrated alfalfa meal, rice bran, dicalcium phosphate, spirulina algae meal, brewers dried yeast, l-ascrobyl-2-polyphosphate, chitosan, vitamin A acetate, d-activated animal sterol, dl-alpha tocopheryl acetate, vitamin B12, riboflavin, d-calcium pantothenate, niacin, choline chloride, menadione dimethylprimidinol bisulfite, pyridoxine hydrochloride, thiamine mononitrate, folic acid, iron sulfate, zinc sulfate, manganous oxide, copper sulfate, cobalt carbonate, ethylenediamine dihydriodide, calcium carbonate, rice hulls, mineral oil, Red 40, ethoxyquin. Aqueon foods contain only natural ingredients and contain no artificial colors. The colors of the foods are attributed to the actual ingredients in the formula, and help to bring out the natural colors in your fish, while keeping them energetic and healthy. Aqueon Betta Pellets contain shrimp and other ingredients that bettas love, and are the perfect size to prevent overfeeding. Formulated so that fish will utilize more of what they eat, creating less waste. Premium ingredients that naturally attract fish, support a healthy immune system, bring out their true colors and provide the essentials for proper growth and vitality. 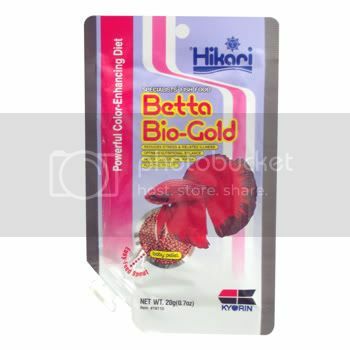 Hikari Betta Bio-Gold enhances the natural brilliant colors of your betta and will help prevent color fading. It’s a completely balanced diet with vitamins added for healthy growth, including vitamin C which is important in reducing stress and fighting off disease. The floating pellets will never cloud the water and disperses evenly. Dispenser package allows you to control the amount of food you feed, helping to prevent overfeeding. All Hikari brand fish foods are manufactured by highly automated and specialized equipment using only high quality ingredients. Fish meal, wheat flour, milt meal, Antarctic krill meal, gluten meal, clam meal, cuttlefish oil, soybean meal, enzyme, garlic, monosodium glutamate, dl-methionine, vitamin A supplement, vitamin D3 supplement, vitamin E supplement, menadione sodium bisulfite (source of vitamin K), thiamine mononitrate, pyridoxine hydrochloride, calcium pantothenate, biotin, inositol, niacin, choline chloride, folic acid, l-ascorbyl-2-polyphosphate (stabilized vitamin C), manganese sulfate, zinc sulfate, ferrous sulfate, magnesium sulfate, cobalt sulfate, calcium iodate, aluminum hydroxide. 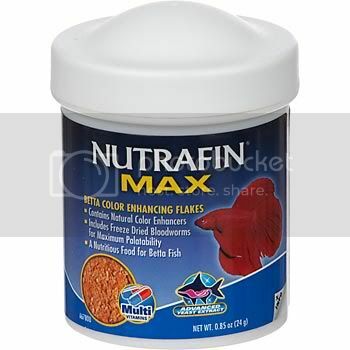 BettaMin is a nutritious, high protein diet that helps promote color and fin development. This specialized combination of small, thin, red flakes and freeze dried brine shrimp is formulated to maximize acceptance and intake. BettaMin does not cloud the water. 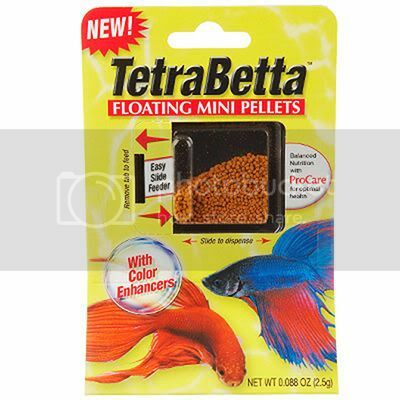 Our TetraBetta Floating Mini Pellets are a nutritionally balanced, premium food that has been specially formulated for Bettas. This highly palatable staple food contains precise amounts of select vitamins and nutrients that help support a strong immune system. Wheat flour, fish meal, wheat gluten, potato protein, corn starch, soybean oil, corn gluten, shrimp meal, dried yeast, monobasic calcium phosphate, lecithin, algae meal, yeast extract, ascorbic acid (source of vitamin C), inositol, niacin, a-tocopherol-acetate (source of vitamin E), riboflavin-5-phosphate, l-ascorbyl-2-phosphate (stabilized vitamin C), choline chloride, d-calcium pantothenate, thiamine mononitrate, pyrodoxine hydrochloride, vitamin A palmitate, menadione sodium bisulfite complex, biotin, cyanocobalamin (source of vitamin B12), cholocalciferol (source of vitamin D3), manganese sulfate, zinc sulfate, ferrous sulfate, cobalt nitrate. Color Includes: Bixin, beta-carotene, canthaxanthin. Ethoxyquin as a preservative. 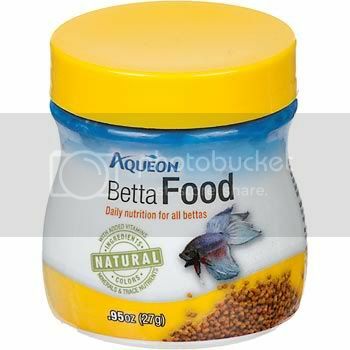 Nutritious ingredients specially blended for bettas. Extraordinary color enhancement is achieved from natural ingredients. Floating mini pellets will not cloud the water. Fish meal, whole grain wheat, shrimp meal, soybean flour, brewers dried yeast, wheat germ meal, wheat gluten, fish protein concentrate, fish oil, l-ascorbyl-2-polyphosphate, crayfish extract in soybean oil, iron oxide, vitamin premix containing (wheat middlings, vitamin A supplement, vitamin D3 supplement, vitamin E supplement, B12 supplement, riboflavin supplement, niacin supplement, calcium pantothenate, menadione sodium bisulfite complex, folic acid, pyridoxine HCI, thiamine mononitrate, d-biotin), choline chloride, marigold petal extract, canthaxanthin, ethoxyquin (as a preservative). VEILTAILS have feelings too... Let them back in the shows! I always fed mine the Top Fin color enhancing bits and he loved them. He lived for nearly 3 years so I don't think there was anything wrong with the food. So is Top Fin good or bad? Last edited by lohachata; 09-26-2011 at 09:52 PM. I was going to say, anything related to Top Fin, Tetra, or Wardley should be left to collect dust. I can buy Wardley flakes at my grocery store....rofl. NLS is an optimum product, and really promotes color enhancement. Pricey but worth it. By the way, excellent post Flare. is there any actual scientific studies to back up what you are posting here ? for any kind of difinitive accurate evidence of the posted statements there would have to have been some pretty exhaustive side by side comparative studies performed..
not just some hobbyists opinion....unless they might be an aquatic nutritional biologist...and even then i would want solid proof to back them up..
if fish meal has whole fish . why is whole fish better than fishmeal ? what are you referring to when you say whole meats ? do you really think that these food manufacturers would put a product out on the market that was bad for your fish ? So many baby multies. PM me! No, I do not have a problem. I like the Atison's Betta Pro, cause that's the only one I used. The 60g last me about 2 last. I just order 7 60g contain from the man himself, so if anyone like a contain ill be please to sell you one or two. I will sell them for $5 each plus $5 shipping. I heard Hikari Betta Bio-Gold is pretty good. But cost a bit to much. Last edited by ForMany; 09-28-2011 at 06:39 PM. I'm sorry, I was just trying to help... I have more research to do, I guess I shouldn't have posted anything until I was totally done. I don't know the difference but I read some place people saying that foods containing fish meal aren't as nutritional as foods that contain more specific meals like arctic krill meal, or even better foods with whole fish (not meal, which is not human grade) like the omega one does. I don't think they're bad for the fish but just like dog and cat food there are brands that are cheap and low quality and brands that are higher quality and made with better ingredients. i sell Plecocaine...it is the name i gave a very high quality food...it is great for all fish...but i never tell people that it is a good staple food...to me ; there really is no such animal as the "perfect staple"....Plecocaine is great for bettas...but not as a staple...it is designed as a food for fast growth of young fish and for priming females for breeding..it is also great to feed 3-4 times a week along with a variety of other foods..